This one was a regular linen envelope, stamped with one of the Tim Holtz stamps (I’ll look up the exact name of the stamp and link it later). It’s a gorgeous stamp that has an aged look to the results that I love. More Tim Holtz – the collage elements came from his digi kits. I normally don’t like dealing with digi-kits because of some of the effort that’s involved, but I think it was worth it. Actually – this last picture shows two. I need to learn how to cover up the addresses so they don’t show. 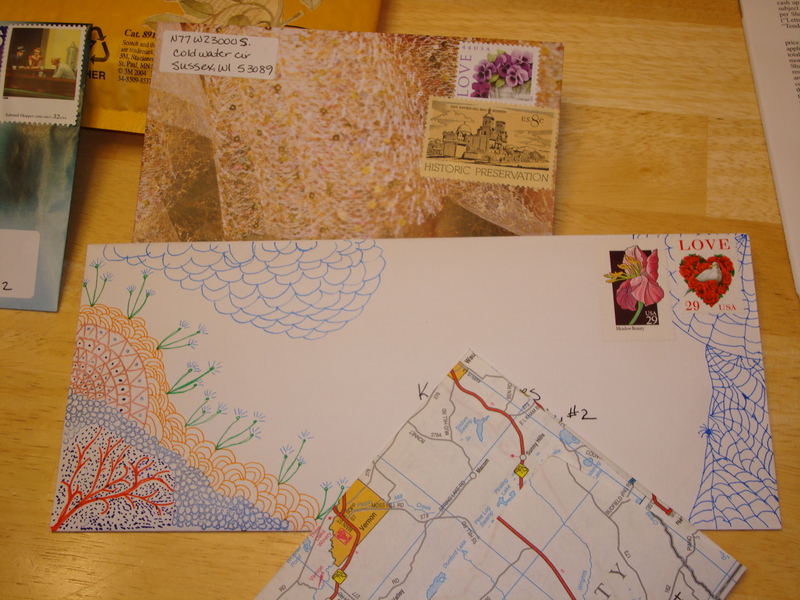 The top one is from a magazine, it’s a shoe advertisement, and the bottom is a linen envelope that I doodled/zentangled/whatever-you-wanna-call-it on. I was stuck with a limited range of pens to work with but it was something different and I had to think about where the addresses/stamps were going as well! 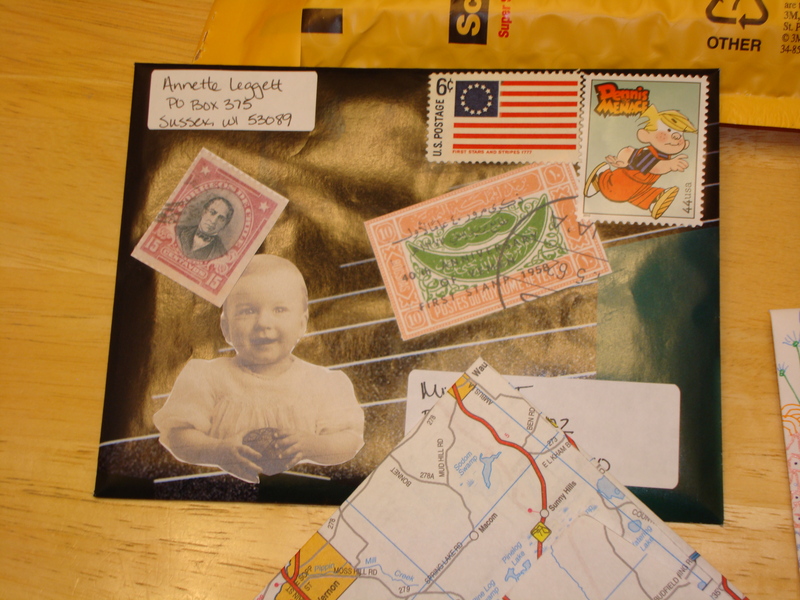 I received your postcrossing card today, WHOA! I saw your blog address, so I thought I would check it out. 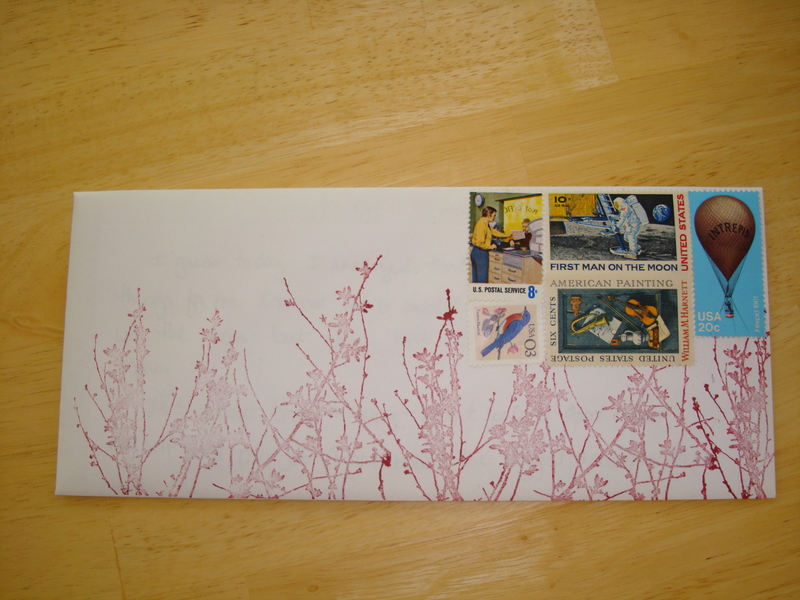 I’m impress with your mail art. You should send some of them in to Altered Arts Mag (you can find them on Facebook or their website). You probably already know about Altered Arts Mag, but I thought that I would mention that they have a ‘mail call’ out just like Good Day Mail. I have a website and blog (business), but I’m just starting my crafting blog so it’s not anywhere near where I want it to be, but I’m working on it. It was good receiving your card and looking over your blog, I’m make sure I bookmark it and follow you too if you don’t mind. Enjoy life and make every day great.